Aikido and Karate are popular martial arts practiced by many people around the world. Their martial art concepts come from opposite ends of the softness/hardness spectrum; Aikido is considered one of the ‘soft’ martial arts, while Karate is classified as a ‘hard’ technique. However, the two share many similarities. A lot of people believe that Aikido is a very passive technique; however, it is actually a dangerous one. The base principle of Aikido comes from the main martial art concept: to kill an opponent. According to an Aikido teacher, any untrained person doesn’t know how to fall and go with the throws. The untrained can easily break their neck, back, or joints. On the other hand, many people view Karate as a hard technique. However, at technical and mental levels, Karate takes a softer appearance. At the beginning, a Karate student needs to execute basic punches to develop muscular strength. This basic movement also helps a practitioner relax while punching and only putting strength at the end. Then, the practitioner needs to align their punches with their body movement. At the later part of the training, the student already knows how to execute a technique with relaxes muscles and posses great spirit. The punches generated during this stage look soft but are actually very strong. In reality, only few Karate practitioners attain this level of technique. The Karate stylist needs to find the most economical and efficient way to execute punches through extensive training and a proper state of mind. Aikido shares this concept with Karate. 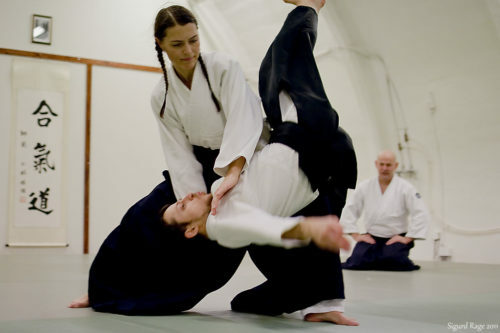 Most Aikido techniques are based on square, triangular, or circular movements. 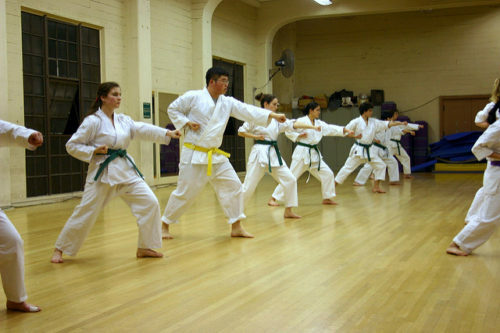 When a student starts to practice, they will perform techniques in a square formation. After several months of diligent practice, they may perform triangular techniques. Then, they will be introduced to circular movements as they progress. At each level, all techniques are economically and efficiently taught to students using a smaller amount of power. Although the training of Karate and Aikido is interpreted differently, the way their techniques evolve is almost the same. In each of their respective levels, a student graduates from a rigid and hard state into a more efficient, economical, and relaxed state. Even the levels of fighting ability and strategy of Karate and Aikido are similar; at the first level, a student needs to control their opponents through combinations of movements. When the opponent begins to attack, a student should hit them. On the next level, one needs to make one’s opponent immobile or use the attacker’s momentum against them. Lastly, the highest level is about the prevention of a confrontation and harmonizing the situation. Furthermore, the similarities between Aikido and Karate fall in these categories: thinking, alignment, connection, proper timing, distance, and state of the body. A person needs to give up their life mentally before an opponent attacks them. In Japan, this is called Mushin, or a state of unconscious thinking. The core principles behind Karate and Aikido are employed in the same parameters. In both techniques, a practitioner needs to move their body in the most economical and efficient way without using resistance or external power. According to experts, the hips, body, and mind move as one and are driven by an incredible internal spirit, which provides an extraordinary feeling. Aikido is a soft technique based on the original concept of martial arts: to kill an enemy. Karate is a hard martial art technique that requires one to execute hard punches first in order to develop muscular strength. Both techniques require greater power of the mind than physical strength. Aikido and Karate share many different features, like training evolution, discipline, and movement. Celine. "Difference Between Aikido and Karate." DifferenceBetween.net. May 30, 2017 < http://www.differencebetween.net/miscellaneous/difference-between-aikido-and-karate/ >. Before starting any martial art you need to consider what is your main goal. Fitness? Self-defense? Stress reduction and focus control? This is a base for selection of the best style for you. Learn techniques to save somebody & self from indiscipline character in the life…B.k.